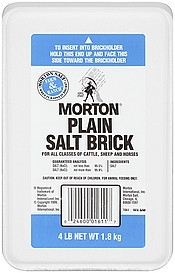 Morton Plain Salt Brick 4 lb. 99.5% salt for horses, goats, and other livestock. Please contact us for current pricing and availability. © 2019 Mars Agway. All rights reserved.